[Update] I have written a book(Full-Stack Web Development with Vue.js and Node) which talks about how we can build web applications using the MEVN technology stack mentioned in this blog. You can find more details on the book here: https://www.packtpub.com/web-development/full-stack-web-development-vuejs-and-node or grab yourself a copy from Amazon here. 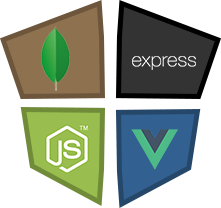 This is the continuation of my previous article (Build full stack web apps with MEVN Stack [Part 1/2]) which focuses on creating a boilerplate for an application using Mongo, ExpressJS, VueJS and NodeJS. This guide will be focused on how to perform CRUD(Create, Read, Update, Delete) operations using ExpressJS and MongoDB(we will be using mongoose). In previous article, we left off to creating an application which when routed to http://localhost:8080/posts would list all the posts via an Api which we connected by creating a service filePostService.js file. Let’s run our client and server with npm run devand npm startrespectively. Now that we have covered CREATE and READ operations, let’s move on to UPDATE and DELETE. Now, we should be able to update our posts. In client/src/components/Posts.vue , let’s call a method when the user clicks Delete button. If you see a # in the url you visit(http://localhost:8080/#/posts), you can turn it of by adding mode: history in your VueJS route file.